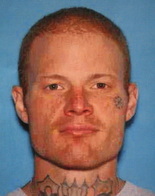 Joseph Pedersen and Holly Ann Grigsby have been arrested in California on suspicion of murders in Washington and Oregon. A Washington couple who appear to have taken off on a West Coast killing spree were nabbed this afternoon north of Sacramento, according to the Oregonian. This bizarre and chilling case of a real life Mickey and Mallory has been unfolding over the course of the day. The suspected killers David Joseph Pedersen, 31 (Chilling mugshot, right), and Holly Ann Grigsby, 24. Were arrested around 1:30 p.m. on Wednesday after a California state trooper spotted their stolen car on the freeway. The white Plymouth Breeze belonged to 19-year old Cody Myers of Lafayette, Ore. Who disappeared over the weekend while headed to the Newport Jazz Fest. Oregon state troopers announced earlier today that they had found the body of a young man in the Willamette. Although police have yet to identify the body, they said that foul play is involved and have notified Myers family, according to the Oregonian which has been monitoring the story closely all day. According the newspaper Myers was described as an affable and friendly young and a devout Christian who loved jazz. And to think that he was killed over a 1999 Plymouth Breeze… Talk about cold blooded. Pedersen and Grigsby were originally wanted for the suspected murder of his stepmother who was found bound and stabbed in her Everett bedroom.